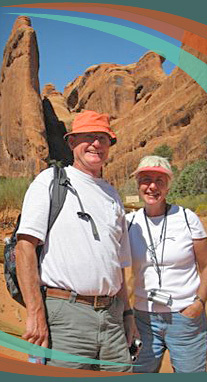 Both native Vermonters, the husband and wife team, Bill and Judy, bring a love of the natural world to their work inspired by rocks, water, plants...the earth. A retired Marine Officer, Bill launched his career as a stone mason after building a memorial planter for his 95-year old mother at Park House in Rochester, Vermont in 1995. Before returning to Vermont, Bill was the general manager for Johnson’s Landscape in Bethesda, MD and had managed the installation crew for Yankee Engineering, Inc. in Baltimore. His work in landscaping, then water gardens, was an natural outgrowth of his stonework. Judy, a former nurse, business owner and retirement home Executive Director, found that a career change brought unexpected, interesting and exciting opportunities her way. She found a creative outlet working with Bill in OutdoorScapes, learning the art of stonescaping, water garden design and installation, while bringing her own extensive experience with perennial gardens to the business.